Although sustainable real estate is still in a nascent stage in the country, India is actually one of the leading counties when it comes to green buildings development. In fact, India ranks only second after the U.S. in terms of the number of green technology projects and built-up area. As of September 2017, more than 4,300 projects utilizing green technology, accounting for approximately 4.7 billion sq.ft. of built-up area, are registered in India as per data shared by IGBC. True, this is only 5% of the total buildings in India. However, the country’s market for green buildings is expected to double in the next few years and may reach up to 10 billion sq.ft. by as early as 2022 – at a valuation of between US$ 35 billion to US$ 50 billion. ANAROCK’s latest real estate research report, Go Green – The Mantra for Sustainable Living, explores the price we have paid for the rampant urbanization and massive population increase in the quest for faster economic growth. These dynamics have caused changes in our overall lifestyle and indeed our quality of life – but that is, arguably, not the worst of the fallout. It has also led to a significant depletion of our natural resources. The rapid rate of depletion and concurrent steep rise in greenhouse gases emission and waste generation have resulted in continuous environmental degradation. This is the primary cause of climate change, the rise in average temperatures and deteriorating air quality in our cities. In recent years, this alarming ecological dynamic has drawn the concerted attention of many countries and kick-started massive efforts to find ways and means to mitigate the rate of deterioration and ensure efficient use of natural resources. 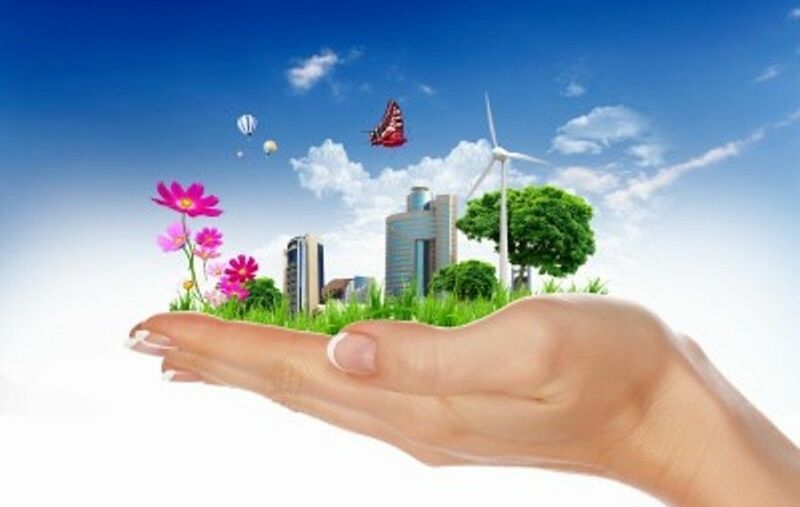 Real estate development is one of the biggest consumers of natural resources (water, energy, raw materials) and generates gargantuan amounts of wastes and pollutants. This sector alone ingests about 40% of natural raw materials, 25% of water and 35% energy resources. In addition, it emits 40% of wastes and 35% of greenhouse gases. By adopting green building practices, the real estate sector can reduce its negative ecological footprint and simultaneously help create a more sustainable environment over the long haul. Efforts towards sustainable real estate development involve the optimal use of natural resources, reduction and recycling of wastes, and significantly reduced pollutant emissions. A sustainable environment is the most precious legacy humankind can leave for the future generations. What constitutes a green building? The UEPA (US Environment Protection Agency) defines green building construction as the practice of using processes and technologies which are environmentally responsible and energy efficient throughout the building’s lifecycle. This includes aptness of the site, design, construction, operations, maintenance, renovation and deconstruction. Green building construction technologies can reduce a building’s energy consumption by 20-30% and water consumption and 30-50%. LEED (USA), BREEAM (UK), DGNB (Germany) and CASBEF (Japan) are a few of the key global entities that define, categorize and certify green buildings across different countries. In India, IGBC and GRIHA are the torchbearers that define the green buildings’ norms. Although the initial cost of constructing a green building can be relatively higher than in conventional ones, the enduring benefits such as low operating cost, better health and enhanced productivity makes sustainable real estate an extremely viable long-term investment decision for both developers and consumers. Over the past few years, the Government (and various organizations and agencies focused on environmental protection) have been working hard to raise awareness about and inclination for green buildings. The thrust is towards emphasizing that green buildings create a more sustainable environment through efficient use of energy and conservation of resources and that these are issues for which everyone, from developers to consumers, must assume responsibility. Limited awareness about green buildings practices and its long-term benefits: Even today, a large section of Indian users is unaware of green buildings’ enduring benefits and perceive them to be expensive and financially unfeasible options. Inadequate government’s rules and policies: The lack and/or inadequacy of mandatory laws to enforce large-scale implementation of green buildings norms is not helpful. Additional clearances and approvals: Developers already go through a tedious process of a multitude of approvals and are apprehensive of the additional burden of green compliances in the list of approvals, which can potentially cause more delays. Insufficient incentives to encourage adoption: There are very few incentive plans, and those that exist vary across states and even cities, depending on different governing bodies. In the majority of cases, incentives are in the form of additional FAR, followed by a rebate on property tax and other schemes. However, these incentives have not been significant enough to encourage large-scale adoption of green buildings practices. The high cost of equipment and products: The equipment and products used in green building construction definitely involve a higher cost than the conventional ones; though the added cost is marginal, many small contractors and developers cannot afford it. Lack of skilled manpower and subject matter experts: In India, a majority of real estate industry stakeholders from policymakers to architects, engineers, contractors and workers simply don’t possess adequate skills and the knowledge required for green buildings construction. In India, the growth of green buildings can be accelerated through standardization of norms, better incentive schemes, robust financial support system – and, most importantly, creating awareness among all stakeholders. 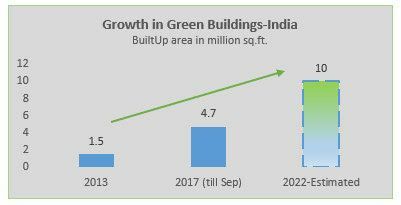 Increased awareness about green buildings and their long-term benefits will surely boost the green buildings sector and lead to the faster expansion of this very vital market segment. Sir, India has crossed 5 billion sft of registered green buildings in March 2018.